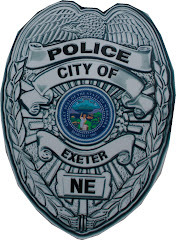 Village of Exeter: Exeter 14U Girls State Softball Champs!!! 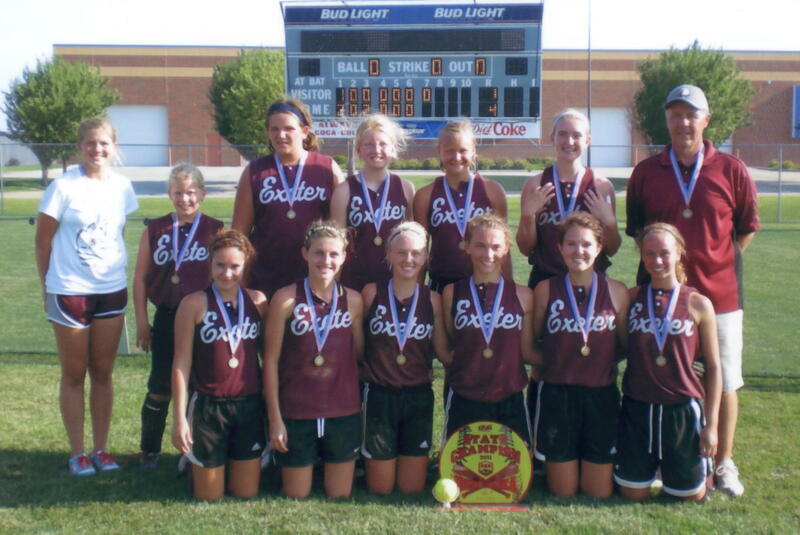 Exeter Girls 14 and under State Softball champion team are pictured in the back row from the left Coach Taylor Erdkamp, Lucy Murphy, Tara Mueller, Sam Horne, Hailey Luzum, Lindsey Stoldorf, Head Coach Bob Ruhl. Front row from the left are Sierra Christiansen, Marissa Howard, Madison Horne, Maitlyn Thomsen, Erica Yound and Janey Due. Not pictured are Coach Kelsey Moore, Haylee Sheffield and Katie Skinner. 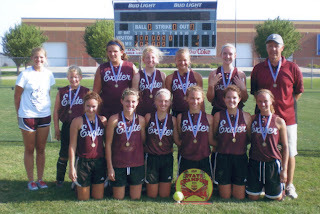 On the weekend of July 8-10, the Exeter 14U girls softball team participated in the ASA Class C State Softball Tournament. The tournament was held at the Smith Complex in Hastings. The girls finished the tournament with a record of 7 and 1. They came home with the Class C State Championship. On Friday afternoon, they opened the tournament with a 10 -0 win over Creighton Thunder. Friday night they defeated Pizza Ranch (West Point) 5-4, scoring 3 runs int he bottom of the 7th inning. The continued play Saturday defeating Tekamah-Herman Purple 6-2. The next game was against Emerson. Exeter came out on top 9-8, to advance to the winners' bracket final. In the first of four straight games on Sunday, they faced Arlington Vets Club. They suffered their first loss of the tournament 7-3. The loss dropped them to the losers' bracket, where they again faced Emerson. This time they won 6-5 in 8 innings. With this win, they moved in to the finals to face Arlington Vets Club. To win the championship, they would have to defeat Arlington twice. The first game was close all the way with Exeter trailing 1-0 going to the bottom of the 7th inning. Erica Yound led off with a triple. With two outs and a count of two strikes, Janey Due doubled to drive in the tying run. Hailey Luzum reached on an infield hit and the winning run scored on an overthrow. With the 2-1 win, Exeter moved in to the second game against Arlington which would decided the championship. Arlington scored one run in the top of the first inning. Exeter scored two runs in the bottom of the first and two runs in the bottom of the third, going on to win 4 -1. Marissa Howard was the winning pitcher in five of the tournament wins, with Madison Horne picking up the win in the other two victories, including a five hitter in the clinching win over Arlington. Leading hitters for the tournament were: Madison Horne with 13 hits, Maitlyn Thomsen and Marissa Howard with 11 hits each, Lindsey Stoldorf with 9 hits, Erica Yound with 8 hits and Janey Due with 7 hits. 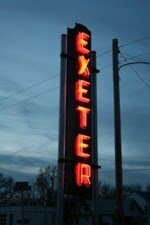 Exeter finished their season with a record of 23 wins and 5 losses.